Dental Crown Procedure. What's involved in getting a crown? Why get a dental crown? What is the dental crown procedure? There are 3 reasons to get a dental crown. First - cosmetic. The tooth is either the wrong colour, the wrong shape (ie. twisted, or else bigger/smaller than it should be), or in the wrong position. Second - the tooth has been weakened by big fillings, and needs something to protect it. Third - The tooth has had a root canal treatment. Let's look at these possibilities one by one. 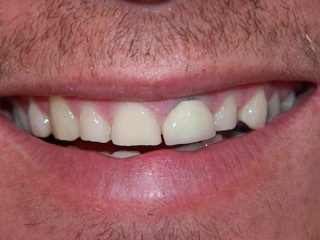 If you have a cosmetic problem with a tooth, one way to correct it may be by putting a crown on it. BUT WAIT - what IS a dental crown? (sometimes it's called a dental cap). A dental crown is like a thimble, that goes over your own natural tooth and hides whatever is under it. Of course, it's not shaped like a thimble - it's shaped like a tooth! And that means that the dentist has to shave down your natural tooth ("drill the tooth down to a peg") so that the dental crown can fit over it, with the size and shape (and colour) to make it look natural. 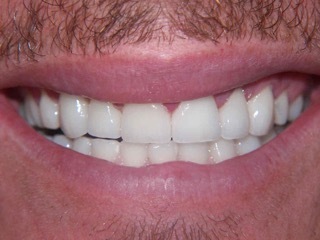 Here's a photo of some dental crowns - before and after. 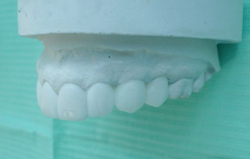 SO, if you have a tooth (or teeth) that have become discoloured for some reason, you can get a dentist to shave down the surface of the tooth and cover it with a dental crown made of porcelain (or ceramic). ALSO, if you have a tooth that is the wrong shape, for example a "peg" tooth that has developed smaller than normal, or an eye tooth ("canine" tooth) that is more prominent than the ideal - your dentist can shave it down and fit a crown to give it a better shape. The next main reason you might want to have a dental crown procedure is to protect a tooth that has been weakened by decay and big fillings. A crown, being like a thimble, covers the entire tooth and filling, and protects it from the tooth above / below, preventing a fracture. Finally, if you have had a root canal treatment, the tooth will normally need a crown over it to ensure that bacteria don't get back into the tooth. There are different materials and designs of dental crown - read more about your options at Dental Crown Cost. OK, WHAT'S INVOLVED IN DENTAL CROWN PROCEDURE? The procedure that a dentist must follow for a crown depends on why the crown is being planned, and what you hope to achieve by getting the crown. He will need to look at how he wants the tooth to look with regard to it's position and size. He will take a mould (or "impression") of your upper and lower teeth. Then he will send these off to the dental laboratory, to be cast up in dental plaster. When he gets the plaster models of your teeth back from the lab, he will trim the tooth that needs a crown, and send it back to the lab to get it built up with white wax in the correct shape and position. This is called a "wax up". When it comes back from the lab again, he can look at the wax up with you, and make sure that you are happy with the shape, size and position of the wax tooth. If you are both happy with the lab result, then the dentist can start work. At your next appointment, the first step is to get your tooth REALLY numb. You can read more about this at Dental Anesthetics. (How to get a painless shot). Then he will take some new impressions of your teeth for the lab. This serves as a record of the starting situation. After that, the dentist will drill down the tooth a bit to make room for the thickness of the dental crown (about 0.5mm to 1.5mm depending on the material - read more about this at Dental Crown Cost). Then he has to take a VERY accurate impression of the tooth he has just worked on. This will produce the model of the tooth that the lab has to work on, to build up your new tooth. (The dental crown). After the dentist is satisfied with the impression (he may need to have 2 or 3 goes at getting a good impression), he will make up a temporary crown in acrylic, to protect your tooth while the permanent crown is being made. The dentist also needs to check the color that you want the new crown to be, to match in with your other teeth. He may also take some photographs to send to the lab to help. A week or 2 later, your dentist will have the crown back, and you can go along to his office to get it fitted. In the final stage of a dental crown procedure, he will numb your tooth again first, then wiggle off the temporary crown. And then he can try the new permanent crown in place, and check how it fits, how it meets your other teeth, and how it looks with regard to color and size. He may need to adjust the crown with a fine polishing tip, to get it to fit between your other teeth, and get the "bite" correct. 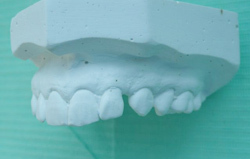 Once he is happy with the fit and position, and YOU are are happy with the overall appearance and colour, he can fit it properly with a dental cement. Or is it? Sometimes there can be problems with a dental crown. You can read more about these possibilities at Dental Crown Problems and also at Pain After Dental Crown. After you get your nice new crown, you need to be aware of a few things. First, don't chew on it for a few hours. Second, clean it like a natural tooth; don't be afraid to brush it and floss it like a normal tooth. After that, forget about it, and get on with life!